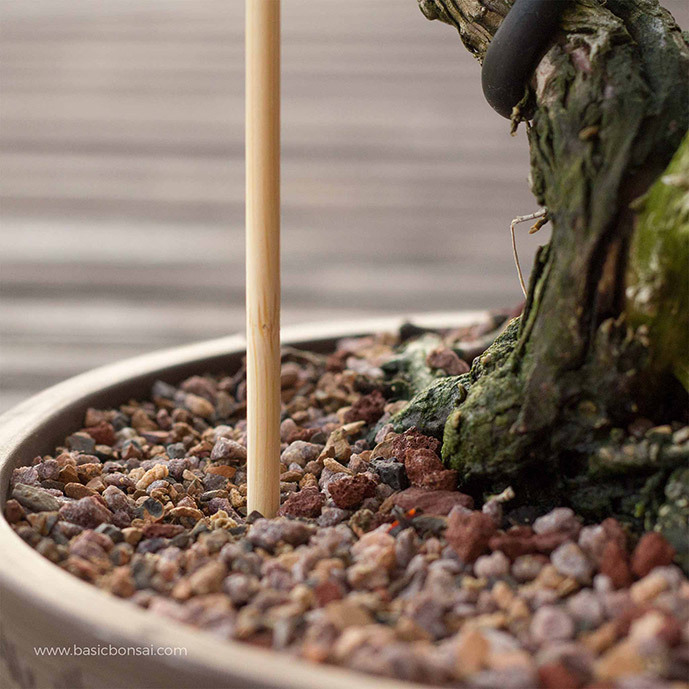 Watering bonsai trees is a fundamental task, and seems like it should be one of the easiest. After all, you’ve likely watered many plants, either in your house or outside in your yard. How hard can watering bonsai be? Over past 10 years, I’ve learned about properly watering bonsai, but not without trial and error. I’ve killed a handful (okay, more than a handful) of trees by either under-watering or over watering. Now you can avoid the mistakes I made, and learn the tips and tricks that I currently use to raise healthy trees. As it turns out, watering a tree that’s confined to a small container isn’t as straightforward as you may think. The art of watering involves observing the tree, allocating the right amount of water, knowing when to water, and maybe more importantly, when not to water. 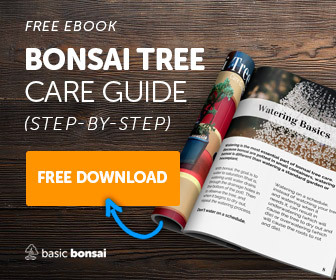 In this article, we’ll explore the basics of watering bonsai trees and specific techniques to help you successfully grow a thriving young bonsai. If you recently acquired a tree from the mall or big box store, it’s a good idea to take a moment and evaluate how the tree is potted in the container. Unfortunately, many trees come in containers that are not ideal for growth, or worse, not conducive for survival. Look at the soil – is there a top layer of rocks on the soil that are glued down? This is a practice used by commercial grows to ensure the soil stays in the pot during shipping, but it can cause problems when caring for the tree. Carefully remove these rocks to expose the soil below. Watering bonsai that doesn’t have the appropriate type of container and soil can be challenging. Look at the underside of the container your bonsai came planted in. Does it have drainage holes? If not, you may need to add a few. These holes allow us to add a good amount of water to the top of the soil, and let a portion of the water run through the soil and out the pot. This drainage process is important, so that only a portion of the water remains on the roots. Depending on where you purchased your first tree, it may be planted in a variety of soils … from garden soil to gravel and everything in-between. The composition of the soil will directly impact its ability to drain, and thus how often you need to water your tree. The ideal bonsai soil drains well, yet retains enough water to feed the roots. 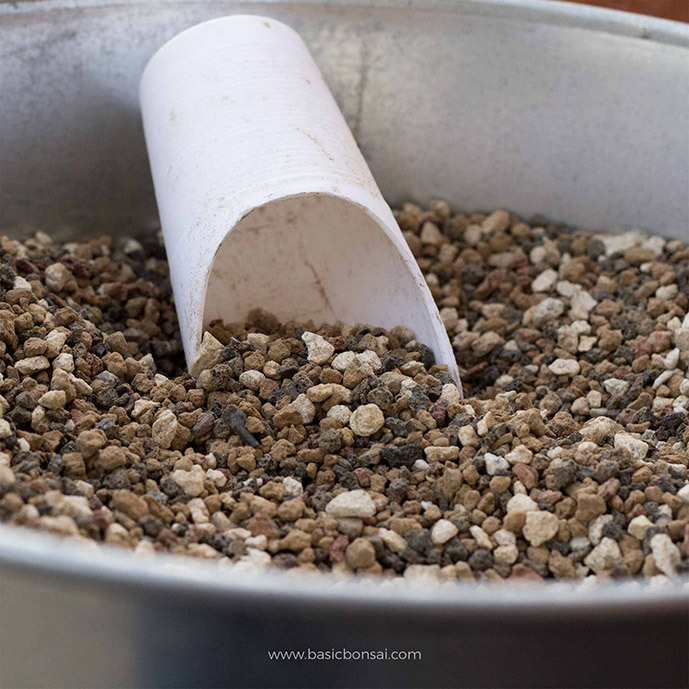 Garden soil will likely retain too much moisture when watering bonsai, and gravel alone won’t retain enough water. Common gardening practice might tell us to water our plants on a set schedule. For instance, many homeowners water their lawns with automatic sprinklers, and some even go as far as installing automated watering systems for the plant life around their yard. Indoor, too, it’s easy to get into a habit of watering plants on a schedule so we don’t forget. We humans are creatures of habit. Consider the container your bonsai is growing in. It’s likely very small, which means the root system for the tree lives in a compact environment. Water too often, and the roots may be prone to rot, as they’re constantly soaking in water. Water too sparsely, and the roots are likely to dry out, thus killing the tree. 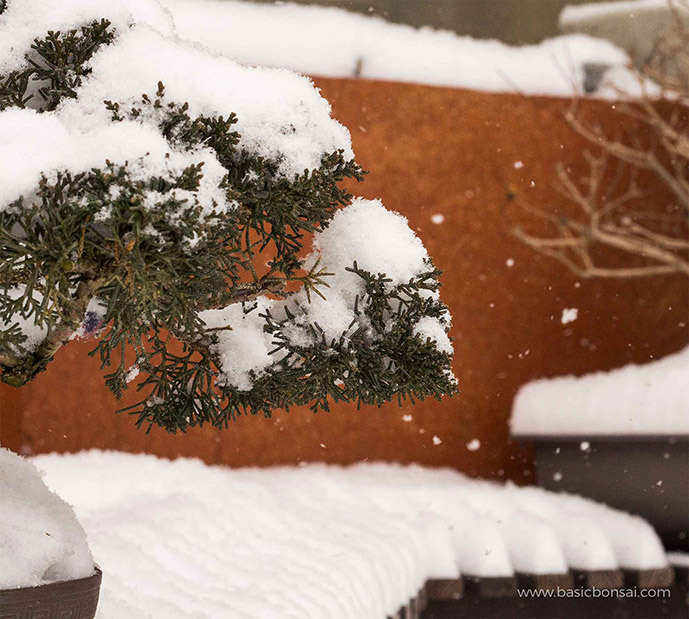 With tiny trees, a schedule isn’t the preferred way for watering bonsai. Instead, we rely on regular observation of the tree, or more importantly, the soil, to understand when water is needed. To understand how much water your tree needs, we need to know how wet the soil is approximately 1” below the soil surface. While it might be tempting to stick your finger in the soil to feel how moist the soil is, it’s better to use a bamboo chopstick. Leave the chopstick in the soil at all times, and each day (twice a day during a very warm or windy day), lift the chopstick out to see if it’s still moist below the soil line. If it is, then the tree doesn’t need immediate water. If the chopstick is only a little bit wet, or beginning to dry out, water thoroughly. Never let your soil become bone dry. This may kill your tree. Watering Bonsai – How much? 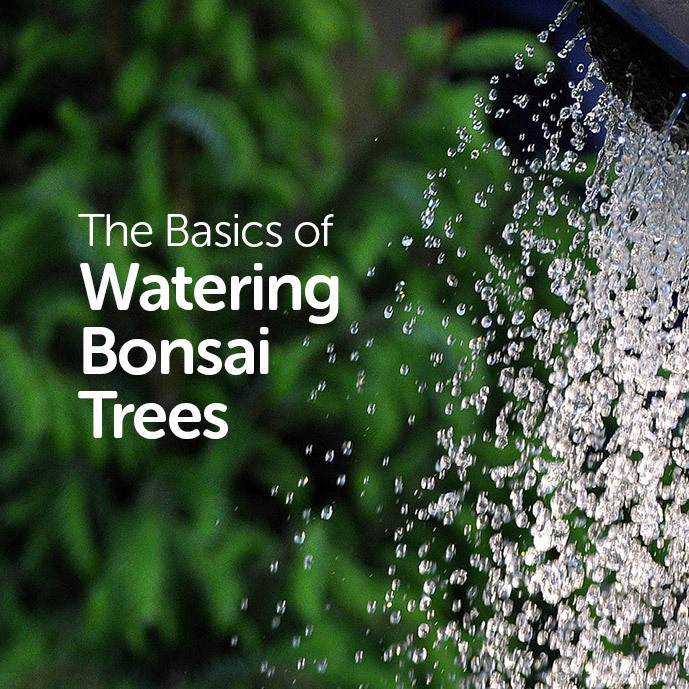 Now that we’ve established when to water your tree, we can move on to the second topic in watering bonsai … how much should you water your tree. When you pull up your chopstick and see that it is beginning to dry out, water it generously. Remember, a tree that’s planted in free draining soil in a pot with drainage holes can take a good amount of water without the risk of overwatering. Water the tree until you see water drain out the holes in the bottom of the pot. Once the water has stopped dripping out the bottom, water it again in the same way. This will ensure that your tree is well-watered. Tip: Be cautious not to wash away the top layer of soil when watering. Tap water is generally accepted as safe for bonsai use. However, it’s best to fill your watering can and allow the water to sit overnight before using. This allows any chlorine that might have been added to your tap water to evaporate. Additionally, if you have the ability to collect rainwater, it is preferred over tap water. Store it in a piece of pottery until ready for use. Check your tree in the morning to see if it has began to dry out. If it has, this is a good time to water. If it hasn’t, check again in the early evening. It is recommended that you avoid watering during the hottest part of the day unless the tree is very dry, or right before sun down. As you can imagine, your tree will need more water in the warm, summer months, and less in the winter. Depending on where you live, your tree may live outside outside in the winter. If it’s buried under snow in the winter, it will need little, if no, water during this period. The topic of misting often comes up in bonsai. 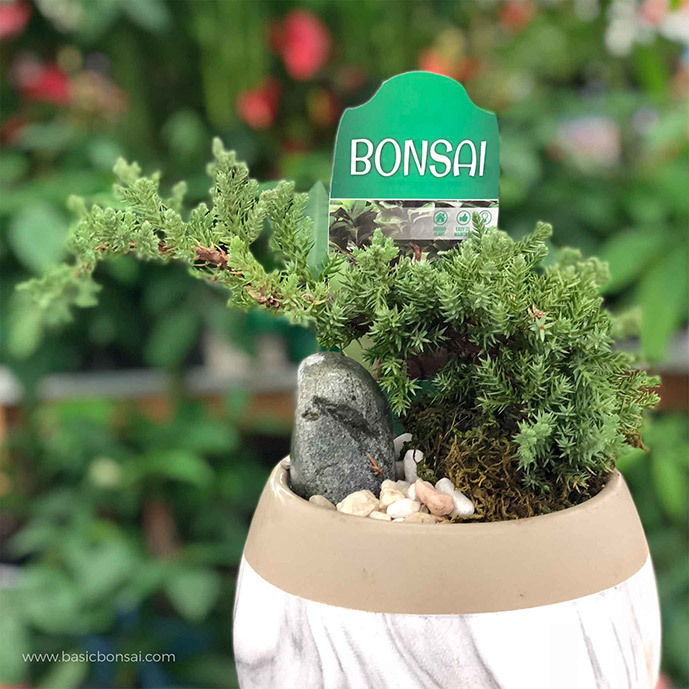 At big box stores, some bonsai only get misted and never properly watered. As we’ve just learned, that can be a big problem, as the trees won’t get the proper amount of water. However, misting does have its place in bonsai. Some species, like juniper, appreciate a daily misting of their foliage. Misting can also be useful for indoor trees that don’t get adequate humidity otherwise. 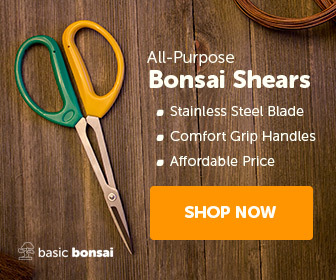 There are two basic tools for watering bonsai; a garden wand and a watering can. Certain wands are made specifically for bonsai. These wands produce a very gentle shower for your tree which mimics a delicate rainfall. This type of wand is ideal, as common garden-store type wands can produce a shower of water that is too intense, and can quickly wash away your tree’s soil. Additionally, watering cans can be a great addition to your garden. These can be used to distribute rain water you may have collected, or simply as a replacement for a garden wand. The same recommendation applies to cans: find one that simulates natural soft rain drops. When water begins to puddle on the surface of the soil, stop watering and allow it to soak in. Once it has soaked in, you can continue to water. Use cold water. If you’re watering on a hot day, be sure to let the hot water run out of the hose before watering the tree. 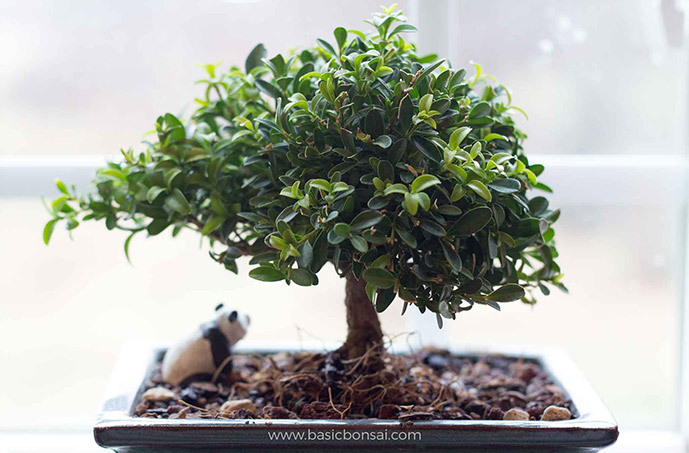 Watering your bonsai tree can be an enjoyable treat that you look forward to. It provides time for you to appreciate your tree, and imagine how it you’ll shape it in the future.